Data-based marketing has evolved tremendously over the last decade. A wave of new channels and technologies today require marketers to manage a new and vastly more complex set of skills to communicate properly with the consumer. Ideally your company has a customer contact strategy that’s implemented and applied across the business. Below is our vision on cross channel campaign management. 15 years ago, the main responsibility of the database marketer was mainly to produce analysis results and outbound DM selections on the customer database. As a result of the introduction of a wave of new media and technologies today’s marketer is required to manage a whole new and vastly more complex set of skills to communicate properly with the consumer. The modern consumer is 24/7 connected, across a broad spectrum of channels and expects relevance in every channel at every moment that he or she decides to interact with you. 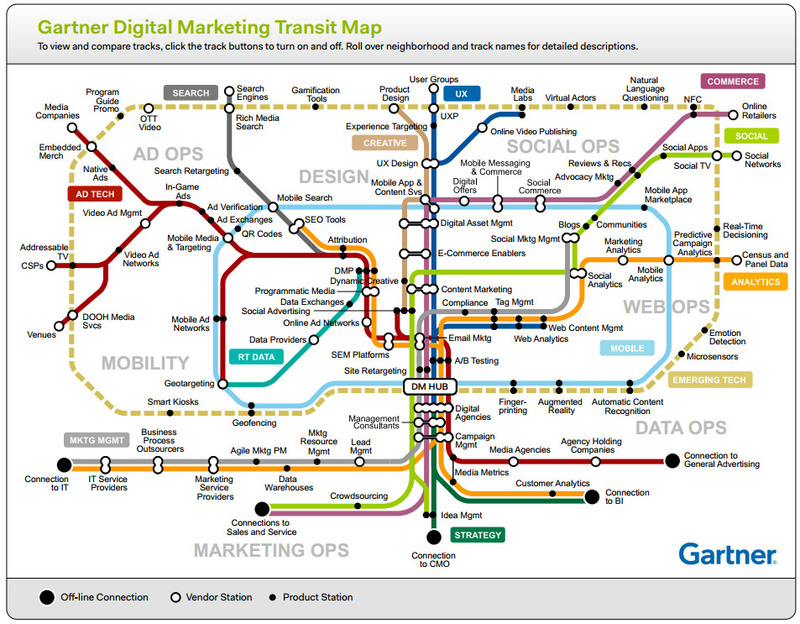 The Gartner Digital marketing transit map gives an idea of the channels marketers have to deal with these days. Relevance indeed. And not only relevance from the consumer’s perspective (with whom you are communicating with). You also need to be relevant from the perspective of the customer’s needs (based on external data and/or previous contact moments) and at every moment in every channel that this consumer is communicating his needs to you. On top of that it’s essential that you find just the right touch with regard to subtlety. Knowing too much can be just as damaging as not knowing enough when it comes to managing the customer relationship. Ideally your company has a customer contact strategy that’s implemented and applied across the business, so that you can be relevant and consistent across all channels. device / channel preferences of the individual customer. In this ever changing work space it is becoming harder and harder for a marketer to balance all these processes. The volumes of data that are being processed and also the increasing set of skills that are required to manage all that, make it virtually impossible to manage all this by hand yourself. New types of marketing software help the marketer to make his tasks more and more efficient to manage. The main responsibility of the marketing team has become to manage all processes using the right set of tools. And in that context, a real-time dialogue has replaced the historic outbound campaigns and programs. As a marketer you need to be able to coordinate across channels seamlessly. A strong grip on Cross channel campaign management or program management is crucial to achieve this. “the process through which organizations segment, target, manage and evaluate multichannel marketing messages. Elements of campaign management functionality include data mining, customer segmentation, customer-event triggering, next-best-action recommendation engines and campaign optimization”. According to this definition, campaign management is a mechanism through which marketing expertise and technology go hand in hand to optimise data-based marketing. Technology can play a very important role in managing and evaluating the effectiveness of programs and campaigns based on business rules. This allows marketers to spend valuable time and energy on implementing and optimising their marketing vision. Technology can play an important facilitating role, because it can help solve operational bottlenecks. Software is not a goal on itself but a means to achieve your goals (cross channel consistent and relevant interaction with your customer). Many companies are organised in various commercial divisions that have a certain amount of autonomy. It is very common for Sales, Marketing intelligence, Marketing communication, Online marketing and PR to be separate teams. These separate teams have their own agendas and very little coordination. If you then try to make the transition to a centrally led marketing approach, all these silo´s will have to converge into a new structure where their own decision making role is often reviewed completely. Not everyone will be comfortable with a change like that. There are many companies out there who still work from legacy systems that were designed long before the multichannel challenge started. As a result it will be very challenging to align them in a structure that facilitates a centrally coordinated approach. Replacing these systems is usually a very painful cost-and labour intensive process because of the fact that these systems are intertwined with all kinds of processes and structures in a way that over time has grown to be completely intransparent. In a recent case study a Dutch major bank calculated that the replacement of legacy systems for the purpose of implementing cross channel campaign management cost them 70 million euros! In decisions involving any software (including marketing tools) IT often is in the lead. To most IT staff, it is not obvious why the software needs of a marketer (flexibility of data-driven communication) are not covered by the existing systems that IT is managing and that contain all the companies data as well (manageable and structured / controllable). As a marketer you’re then challenged on subjects that are not your primary field of expertise, like costs of cross channel marketing integration or data security. The step to cross channel campaign management usually presents additional challenges to an organisation that are easy to underestimate up front. Examples are IT-related matters, but also marketing communication (like producing the required content, which can be a lot! ), cross channel data linkage (how do I recognise the same customer especially in channels where he is under normal circumstances anonymous) and proposition development / matching the right propositions to the right segments. Centralize control: Choose a route in which the marketer or the business is in control. Every structure based on the notion that parts of the responsibility of a coordinated approach to campaign management can be divided over multiple disciplines or depends on IT resources is doomed to fail. 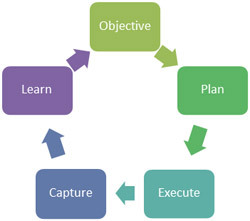 Objectives and technology: First decide what objectives you are trying to achieve, then in a second stage what technology you need to achieve it. After all, technology is a means to an end, not a purpose in itself. Also, limit yourself to the objectives you can manage. You are not required to do everything just because everyone else is doing it too. An important prioritisation mechanism is finding out whether you´re making your customer happy by implementing new technologies. Choose a scalable solution: The best way to convince your organisation of the benefits of cross channel campaign management is to start small and present evidence of successes before asking for large investments. Make a long term plateau planning and make sure you can present every new plateau as a result in itself, justifying the next steps. Celebrate successes so that everyone can see your approach is working! Develop and use buyer persona´s: These buyer persona’s include context, current position in the customer life cycle and also channel and communication preferences. Personas are a great way to segment your customers in a manageable way. Many suppliers of marketing software use the term “segment of one” these days, implying that it´s possible to define unique communication strategies automatically generated on individual customers´ preferences. However, trying to implement this in the way it is meant, puts an awful lot of pressure on your product- and content teams. In reality, the extra effort does not generate the ROI compared to working with segments. Segment-of-one technologies end up re-using the same content into contact strategies with less variation as you would expect from the term. Prepare for the future: Take into account that the marketing domain will keep on evolving very rapidly. It becomes pretty much impossible to combine all required competence fields within your limited amount of marketing FTE’s. Using marketing agencies that have a broad variety of flexible marketing competences is going to be the only way to manage the marketing process for all but the largest companies in the world. And that’s a good thing: Being able to use resources only when you need them can be much more efficient than having all your resources on your payroll and can have a beneficial impact on quality. It is always better to have a solid but basic customer contact strategy that works and that is implemented consistently than to have a hugely advanced and complex 1:1 strategy that your company can’t manage. So start small and build up within the constraints of size and complexity that your company has. It’s important that you keep control over the way you’re managing your interaction with the customer. The most important thing is a solution that gives control within the marketing team and manages it centrally. Technology is just facilitator. Automate what is feasible, make sure that you as a marketer can spend your time deciding what you want to do, not how you’re going to make it happen. In the end that’s what technology should do for you. Ed Kassens has 20 years of experience in the field of data driven marketing. Ed is a passionate marketing believer with the conviction that Database Marketing for every organisation can be a fantastic money-maker if it is applied in the right manner. Ed has a Master’s degree in Econometrics, and lots of experience in applying segmentation principles in targeted marketing processes. He has a large number of publications and keynote speeches to his name about the subject.